Here's a delicious recipe from the "dessert" chapter of FROST BITE. 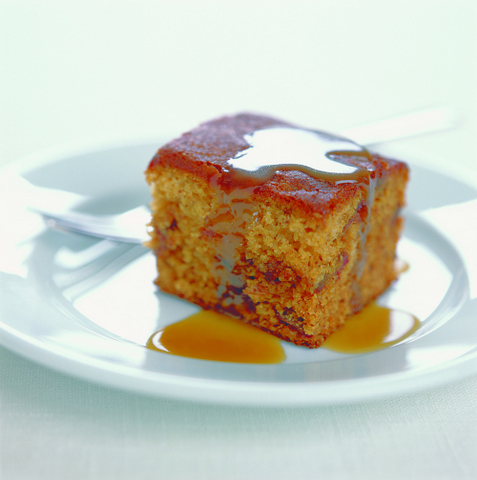 This is the quintessential winter pudding, loved by everyone, and it freezes beautifully. Preheat oven to 180°C (350°F) and grease and line a 20cm (8in.) square or round cake tin. Place dates, bicarb soda and boiling water in a small bowl then set aside to cool. Beat butter and sugar in a large mixing bowl for several minutes or until pale and creamy. Add vanilla and eggs, beating well after each addition. Add the sifted flour then fold in the date mixture. Stir gently until everything is well combined. Pour into prepared tin and bake in oven for about 45 mins or until a skewer inserted in the middle comes out cleanly. Leave in tin for 10 mins before turning out onto a cake rack to cool. Butterscotch sauce: place all ingredients in a small saucepan over low-medium heat. Stir until butter has melted and sugar has dissolved. Bring to a simmer then remove from heat and allow to cool. Freeze: Wrap the cooled pudding in cling wrap and freeze. Pour the cooled butterscotch sauce into a plastic container and freeze. Defrost: On kitchen bench or in the fridge. Individual slices can be defrosted in the microwave. Sauce can be defrosted in the microwave. Reheat: Place pudding on a microwave-friendly serving plate then microwave for a couple of minutes or until warmed through. You could wrap the pudding in foil and warm in a 180°C (350°F) oven for about 15 minutes if you prefer. Reheat sauce on the stove or in the microwave. Serve: Serve slices of the pudding with plenty of sauce and scoops of vanilla ice-cream.